Brady Premium Reels - Black Durable Badge Reel Has a Twist Free Design and Strap End Fitting that Holds Slotted Cards. Quantity of 25. 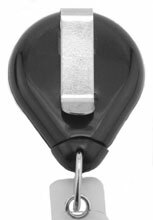 The Brady 605-I-BLK is also known as Brady People ID	605-I-BLK	or 605IBLK	.